Since we are well and truly into Summer, you may be wanting to add a pool to your home to overcome the hot summer days. Over the past decade, swimming pools have changed a lot. Let’s take a look at some of the trending pool designs in 2019. The shift to automated technology in pools has meant greater ease of cleaning, balancing water pH and heating. Some systems allow you to control your pool's filtration, lighting and water features remotely. This kind of technology is becoming more affordable as smart home automation continues to develop. We recommend talking to Dayatech home automation if you are wanting to add automation to your pool. Simplicity in home design is reflected in people's desire for a simple pool shape. It's about taking a holistic approach and linking the home, pool and exterior. The contemporary pool has clean, elegant lines without the busy curves of the kidney-shaped pool of earlier decades. There's nothing like a crisp infinity edge to create a resort style feel and to draw your eyes to a view. Combining an infinity edge with sleek tiles creates a sense of impact and opulence. Splash decks – shallow areas worked into the edge of the pool, where you can sit in a deckchair and dangle your feet in the water while enjoying a book. Manufacturers have been savvy to the fact that Australian backyards are shrinking. You don't have to let a small yard prevent you from having a pool anymore. These days, plunge designs can even incorporate swim jets, enabling you to have the same health benefits as a much larger pool. One significant change that has expanded the scope of pool ownership for people with steep blocks is an expansion in the range of above-ground fibreglass pools. These new shells slot into sloping backyards with ease. Previously, you might have spent $50,000 on excavation and a retaining wall, but this style of pool does away with that extra expense. Put a beautiful deck around them and they look sensational. 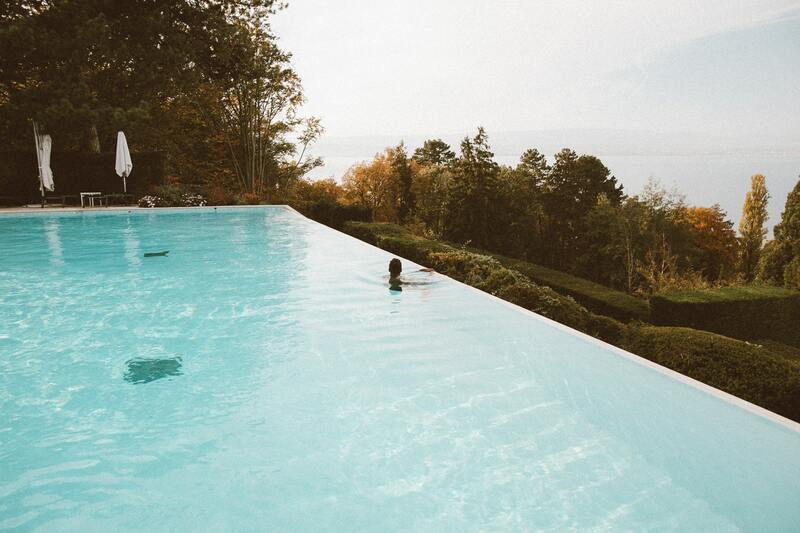 There's been a surge of interest in pools that are chemical-free. In-ground billabong-style pools, are becoming a big hit depending on the home. A chemical-free pool requires no chlorine, instead using aquatic plants to oxygenate the water and filter it (in tandem with a sophisticated submerged pump system). Natural swimming pools are more expensive, but the sensation of swimming in 'living water' really can't be beaten. If a complete chemical free pool is out of your budget, why not try a magnesium pool instead. When it comes to the pool's finish, your options are broader than ever. In the past, fibreglass pools tended to come in blue, but the colour palette has widened hugely to now include whites, greys and blacks. A white pool will give your water a sparkling Whitsundays look, while black creates water that reflects its surrounds. Let the design of your home inform the style, shape and finish of your pool.